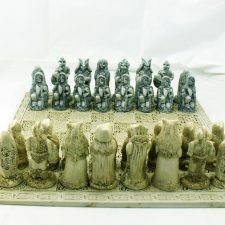 In this category you will find unique chess sets. Isle of Lewis Chess Set, Little Folk Chess Set, Celtic Chess Set. 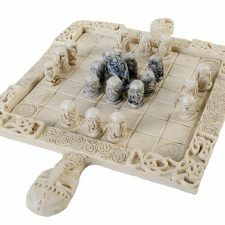 Play the ancient Irish game of ‘Fidchell’ with our Celtic Chess Set. Choose from our Irish and Celtic Chess Sets, which are fantastic playing sets and also great looking pieces of furniture. Chess Sets make wonderful Irish gifts suitable for lots of different occasions, especially for St. Patrick’s Day, Birthdays, Christmas, Anniversaries, Wedding Gifts and more. The Isle of Lewis chessmen are a treasure of the Celtic world, on a par with the Tara broach and the Armagh chalice, though they were probably made in Norway. The pieces were discovered in 1831 by a Malcom Macleod, in a small stone kist in a sand dune on the Isle of Lewis which is located in the Outer Hebrides of Scotland. When the chess pieces were made, in the middle ages, these islands were ruled by Norway. The pieces were made from ivory and whale teeth. 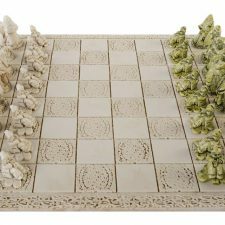 Our Isle of Lewis chess set faithfully reproduces the original except the pieces are made from cold cast porcelain, which means they are beautiful but also hard to break. They are 100% handmade by O’ Gowna of Co. Dublin. This is appropriate as it is believed the set was on its way to being traded in Dublin when it was stored away on the Isle of Lewis. The Isle of Lewis chess set is one of our finest and most beautiful Irish gifts and we are proud to offer it together with our other Celtic chess sets. What a gift it would make for someone who enjoys this game of games, as a display piece in a room or as a corporate gift for a well-deserving executive. 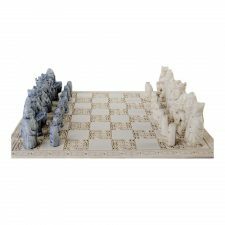 Playing chess is all about imagination and these pieces certainly stir the imagination with their shield biting berserkers, knights on horses and worried, side glancing soldiers. When we think of Vikings and Norsemen, we automatically think of raiding and plundering. We don’t think of them playing chess, this most civilised of games. But, then again, history is full of surprises. 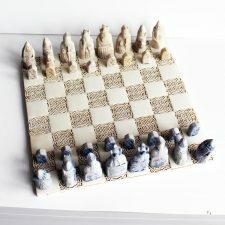 The Isle of Lewis chess set would make an astonishing gift for someone who is interested in this period of European history. 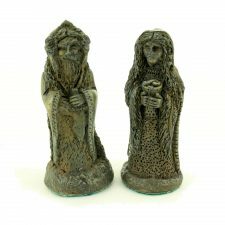 For someone who is interested in Irish mythology, our Celtic Legends chess set would make a fantastic gift. Before there were leprechauns and fairies there were the Tuatha De Danann, the Formorians and other mythological races which populate Irish mythology. The chess pieces are represented by these fabulous beings, again, stimulating the imagination which makes for a more satisfying game. Because our Celtic chess sets look so beautiful and elegant they can be used decoratively to show some sophistication and class. You can take pleasure in simply looking at the figures, they are so finely hand crafted. Any Celtophile will love to receive one of our stunning chess sets as a gift, even if they don’t play the game. If you are a parent and you want to spend more time with your son or daughter, why not teach them how to play chess with one of our fabulous sets? Our Celtic Legends set would be a fun way to learn as well as engendering an interest in Irish mythology. Our Isle of Lewis set would also make a fine gift for a student of Celtic Civilisation or archaeology. Maybe they have graduated and you want to present them with something that reflects their achievement. The set is perfect for this. The pieces of our Isle of Lewis chess set are made to last so it can be handed down through the generations. What a fine inheritance it would make! The pieces are the best preserved medieval chess set in the world, which allows our source to reproduce them exactly. All the quirky expressions of the original pieces are remade. Each piece is hand crafted so no two pieces are exactly the same. This treasure of the Celtic world can be yours to give away for a surprisingly low price. The Isle of Lewis chess set is a gift that would suit all occasions – anyone would be delighted to receive it, even if they don’t know the history. Kids would get hours of fun out of it. It might take them away from the X Box for a while and this can’t be a bad thing! We are proud of our range of Celtic chess sets. They are amongst the finest hand crafted gifts we have on offer. If you do buy one, you won’t want to give it away they are so impressive! So, make a gift of one of our Irish chess sets and you will see from their reaction that they will never forget it. It is a gift for life.